From the extensive patio area you have views of the rolling hills in front of the finca over to the sierras and beyond. Alora glimmers on the hillside by day and the town twinkles at night. The finca is built in traditional style to a high standard. High wooden ceilings, terracotta floor tiles and white walls offer a taste of Spanish country lifestyle with comfort and well thought out facilities. Take a 30 minute drive to the lakes of El Chorro and you can BBQ, eat at one of the restaurants with fabulous views over the lakes, swim, canoe or fish. Local restaurants are on hand to suit every pocket. Heading north is the unique ‘Lobo’ wolf park where moonlit BBQs are held and at dusk the wolves’ howl and you can join in! Antequera is a small city with shops, churches, bullring and a café lifestyle. Still within 35 minutes is Malaga old town for culture, cafes, art galleries, museums and extremely good restaurants and bars. Venture further afield but within the hour, Marbella and Porta Banus and see the world’s finest yachts on display, or Ronda, a picturesque town high on a cliff. I live in Oxfordshire and work in London, but holiday in Alora because Andalucia is such a stunning area of Spain. I have worked in the public sector housing department for 24 years and working hard, commuting each day, means my breaks to Finca Miel have always been valued very much. Recently my 'not mum' of 72 joined me at easter for the first time, she fell in love with it could not resist the pool! and we have already booked for september. A returning guest this year said it best of all... "I started to write this from the Finca, but always got distracted by the urgency of standing perfectly still to listen to the silence, or just looking open mouthed, again and again, at that view. Then there were all those time consuming urgent tasks like swimming in the pool, pottering up the hill to see the 360 degree panorama from the field behind the house - oh and mustn’t forget all those breakfasts and dinners watching the sun rise and set! So this letter never got written! Had I written it I would have said that being at Finca Miel “replenishes my soul”. I can’t think of another way of expressing it. We’ve been coming to the hills and valley around Alora for years, and I can’t imagine not wanting to return forever. In the early days we thought we could afford a 2nd home, but that was just before the 2008 crash hit us, so it’s probably more of a ‘dream’ now. So in the meantime we will just keep returning, and hopefully renting Finca Miel lots and lots! We’re already making plans for next year, and this time April/May look promising. I wonder if you have any bookings yet, or if you are going out yourself?" For me it is a fabulous area that offers infinite views without moving from the patio if I don't want to. Alora is a vibrant spanish town with all festivals celebarted in traditional ways that are great to see and only a 5 min drive away. I am always discovering new tapas bars to delight the taste buds. Just 35 mins from the sea is great, yet the cost of living here makes holidays far more affordable compared to the coast. 30 mins from the lakes at El Chorro that have to be seen to be believed. Its has the balance of escapism, yet it is within an hours drive from cities like Antequera, Ronda, Malaga and Marbella that give you culture and richness in whatever you are looking for. Granada the snow topped mountains of the sierras and Seville under 2 hours away. It has to be the view to the mountain ranges where nature paints a new picture to explore every day and so vibrant and clear in the winter and spring, hazy romanticism in the summer with the lights of Alora in front of you at night It really has a sense of getting away without remoteness or being in pitch black at night and just off a good road easy to find. Not being overlooked gives you real privacy with a few neighbours below. It was just an empty shell when I bought it so I was able to form the outside area to deal with sun, shade, wind and maintain the views just how I wanted, a true extension to the house with patio and pool directly outside the front door. Good BBQ as I am a great fan of cooking outside with comfy seating and dining area. Bathroom 1 is very spacious with toilet; bidet; hand basin; bath and integral shower with plenty of storage space. Bathroom 2 has a shower, hand basin and toilet with storage space. Living/dining area with open log fire, comfy 4-seater sofa, 2 further seats, dining table seating 6 comfortably, 32” TV with satellite, Wi Fi, I Pod/I Pad connector, DVD, CD, radio, collection of films and CD’s, a well stocked bookshelf and a few games. The kitchen is equipped to a very high standard with plenty of workspace, ample storage, large frost free freezer and fridge, 5 ring gas hob, electric oven, microwave, washing machine, iron, electric mixer, toaster, large range of serving dishes etc! Notes on accommodation: I Pad and I Pod adapters, cables for your own films and music Outside: Outside is an extensive patio with outdoor dining suite seating 10 with ease, a purpose built BBQ that looks out over the lights of Alora at night, comfortable 3 piece suite and coffee table. The terrace has dappled shade provided under a large pergola and access to full sun next to the private pool. Side planters with high rear walls offer all round greenery, flowers and act as wind breakers. The pool is 8x4m, you can stand up at both ends of the pool if you are 1.62 meters tall. This means ample space for pool games without treading water! There are endless walking opportunities and 2 stables in walking distance from the finca to suit all skills and experience. From the terrace you can view sierras over towards the lakes of El Chorro and up to the Valley Del Abdalajis climbing crags where you often see parasending taking place. Cleaning / Towels / Linen / Maid service: We ask guests to bring their own pool/beach towels. We must advise guests there is no smoking inside the house. Other: Patio area has an excellent brick built BBQ with gas ring adjacent and lit counters for easy summer cooking. An easy clean terracotta tiled dining table and benches that seat 10 comfortably. Mini outdoor suite with cushions and 4 sun loungers. Charming Finca with a view! A traditional Finca in a beautiful setting. Very peaceful, giving every opportunity to totally relax. The view is like a picture postcard, with the added bonus of beautiful sunsets and stunning views of the stars. The track up the hill to get to this location is quite daunting the first time. However if you follow the instructions provided in the directions it quickly becomes less of a concern. It is a good 15 minute drive to get to Alora and the supermarket. Staying in February it did become cold as soon as the sun set but we bought logs from the petrol station and built a real fire each evening which was very cosy. There was also a portable gas fire available if required. We did cook at the Finca most days making use of the BBQ as well as the kitchen. There was plenty of kitchen equipment, crockery and cutlery to facilitate this. There are however not any basic condiments left for general use. The bed was comfortable with electric blankets available if required. There is also a lovely pool available but it wasn’t warm enough in February for us to use. Internet connection was great considering we were in such a rural location. There were some things that were not up to scratch, but they did not detract from our enjoyment of the Finca. We were a last minute booking and so that may have been the reason for this. The shower head in the main bathroom needs replacement as it causes a flood in the bathroom each time you shower. The shower curtain is mouldy. Neither the BBQ or oven had been cleaned since the previous occupant. There were a couple of under cupboard lights not working in the kitchen with no replacement bulbs. The washing machine door handle was broken making it difficult to open and the drum appears loose causing major vibration whilst on the spin cycle. Instructions for the TV in the house manual are out of date. And UK TV channels are not available and will not be until a new receiver for the satellite is purchased. These were only small annoyances and so were not reported during our stay. ( Apart from the UK TV as we had really wanted to watch the Six Nations) but should be resolved to improve the experience of the next guests. All communication/responses from the host and the guy who manages the property were quick and helpful. I would definitely recommend Finca Miel if you are looking for a peaceful, get away from it all beak. We thoroughly enjoyed our stay. We thoroughly enjoyed our stay at Finca Miel. Set in the hills close to Alora the house and pool face to the west allowing you to enjoy long days relaxing in the sun, or taking trips around the surrounding area - definitely recommend the walking the Caminito del Rey (sensible to book ahead on-line). Finca Miel has everything you need, including a BBQ. It is well kept and the pool is perfect. Watching the sun set over the hills above El Chorro each night was a real highlight. Andrea nothing makes me happier than a review as complimentary as yours. I enjoy sharing this special space, especially when you just get it, and enjoy it. The house is a perfect place to stay. The descrition of the house is completely accurate and facilities are very good. The house is really comfortable and it has marvellous views. The owner provided us all the information needed. I would recommend this house to everyone willing to enjoy the countryside. We arrived late at night in the dark and awoke the next morning to the stunning views. What an amazing position. It is only a short drive inland from the coast but a totally different world - a taste of real Spain. January, and in the all too short 3 days we were there the temperature reached 18 degrees and glorious sunshine. The finca is beautifully rustic (love all the terracotta dishes and pots) and not overlooked by any other property. It has plenty of room, very comfortable beds and everything you need. Internet access was very good, but do yourselves a favour and turn off all of your technology and just soak up the peaceful and relaxing surroundings. We met our daughter who is staying nearby in El Chorro and she took us on a few walks in the mountain forests and lakes nearby. We had a meal in a restaurant high up overlooking a lake. It was warm enough to eat on the outside terrace. Absolutely amazing scenery. The owner Karen responded very quickly to our emails and sent us very useful information on the property with detailed directions to the finca from the airport. We would definitely stay here again but next time for longer. Beautiful villa in a fabulous location. Alora is a beautiful village with plenty of bars and restaurants. Accommodation was well equipped, the 2 bathrooms were a godsend. Everything was very clean and well set out. The weather was fine with only one rainy afternoon but there was always a breeze blowing, the pool was lovely but too cold for me - the teenagers did manage to get in on one occasion. Internet access was brilliant, TV, DVDs and games also very handy in the evening. We tended to eat out in the day and just have a simple supper or barbecue in the evenings so that we didn't have to drive up the access track at night. . Excellent holiday - would definitely return - I think in Summer perhaps to make more use of the pool and loungers. Lots of things to do in the area and it was also very scenic with all the orange and lemon trees and olive groves. Alora the local village is vibrant busy packed with shops, restaurants, tapas bars, morning cafes. Fiestas are very well attended with lots of activity packing the town with spanish culture and a great atmosphere. Rock climbing and para gliding, scrambling in nearby towns and villages, yoga centre. El Chorro lakes are freshwater non motorised water enjoyment with canoes and floats. El Torcal national parquet is stunning and has morning walks to really enjoy the impressive views and unique rock formation. Handy to drop into Antequera afterwards for great tapas bars and restaurants as well architecture and bull ring. The Lobo (Wolf) Park on the way to Antequera is a wonderful and intersting option for all the family - with insight into how wolves live and a great full moon outdoor BBQ and howling!! Nearest airport is Malaga 45 mins door to door. Car hire is essential. Please note that all car hire companies require a current credit card to be produced at the time of pick up. I have been using DelPasso and found their cars in good condition and reasonable, tank is full to return full. Booking Notes: Please contact owner. Changeover Day: Preferred changeover day is Saturday however, this is flexible. Notes on prices: Prices are based on a 4 person rental basis. Please add £50 per person, per week, for 5th and 6th guests. An additional £50 per week over all British bank holidays. 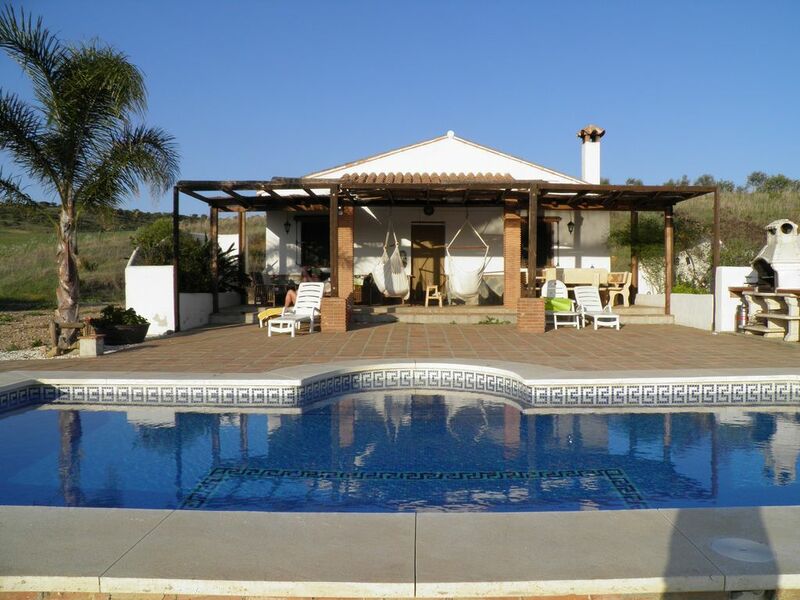 A £100 refundable deposit is required to reserve the finca, the deposit is refunded within 5 working days of the keys being returned and no damages confirmed.